What's this? Spectrum brushes launched last year, offering a range of beautiful brush sets for a super affordable price. When they brought out their Marbelous range in March, I knew I had to get my hands on some - white and rose gold are right up my street! My lovely housemates bought me the eye set for my birthday, which comprises of 8 brushes (only 7 are shown here as I'd already used one!). It has a nice variety of sizes, with blending brushes, a pencil brush and some short shader brushes. Where can I get it? Their website - Spectrum Collections and Beauty Bay also stock some of the range too. The link to my particular set is here and it's £34.99. The Pros... For the price, these are absolutely amazing! I've found myself reaching for them more and more when doing eye makeup. My particular favourites are the pencil brush, short shader brush (amazing for the lower lash line) and the fluffy blending brush (the one not shown in the picture!). They blend out colour really well, wash nicely and - let's be honest - they've got to be some of the prettiest makeup brushes in my collection! It works out at around £4 per brush, which is miles cheaper than most on the market. The handles feel nice and sturdy and I love the sleek white handle and the rose gold ferrel. The Cons... My only gripe with this collection in particular is that it doesn't seem to have a flat applicator brush - something like the MAC 242 or anything to apply lid colour. Every brush has some fluffiness to it, so I do have to use a different brush to apply lid colour, especially if it's something like a glitter or a pigment. One of the blending brushes is quite chunky so I think I'd only use that to buff out shadows or apply a transition colour so maybe that could've been swapped for a lid brush. Other than that though, I've been very impressed by the collection, and I would 100% recommend them to any makeup junkie or even someone looking for a good first eye brush set that won't break the bank. What do you think? 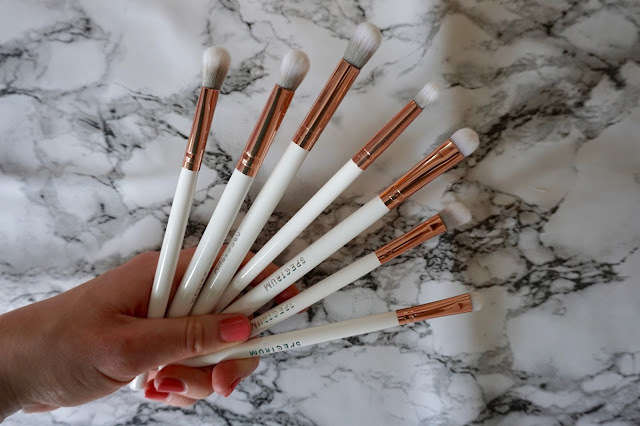 Have you tried any Spectrum brushes? Let me know in the comments!